The Alec Bradley Black Market Estelí premium cigar line is a highly anticipated new spin on the original Black Market blend. This new blend incorporates a Nicaraguan wrapper with two binders, one from Nicaragua and one from Honduras. The filler is comprised of carefully selected and perfectly aged Nicaraguan tobaccos. Medium to full bodied, this delicious and complex Cuban style cigar provides a balanced combination of spice, earth, and pepper, accented with exquisite notes of coffee, cashews, and sweet cream. 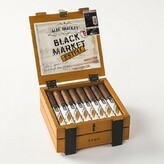 Destined to become one of Alec Bradley's most endearing new cigars.